Nico Rosberg has been celebrating his world championship victory for the past few days, but now he's hit the headlines for a completely different reason. The German driver has confirmed he will retire from Formula One with immediate effect, just five days after winning his first (and now only) world title. Rosberg had been under contract with Mercedes for the 2017 season but has decided that after a really long year, it's time to bow out at the top of his game. The statement he released tells more of the struggles. This season, I tell you, it was so damn tough. I pushed like crazy in every area after the disappointments of the last two years; they fuelled my motivation to levels I had never experienced before. And of course that had an impact on the ones I love, too – it was a whole family effort of sacrifice, putting everything behind our target. I cannot find enough words to thank my wife Vivian; she has been incredible. She understood that this year was the big one, our opportunity to do it, and created the space for me to get full recovery between every race, looking after our daughter each night, taking over when things got tough and putting our championship first. Whilst the announcement is on the surface a shock and surprise, it does actually make sense. 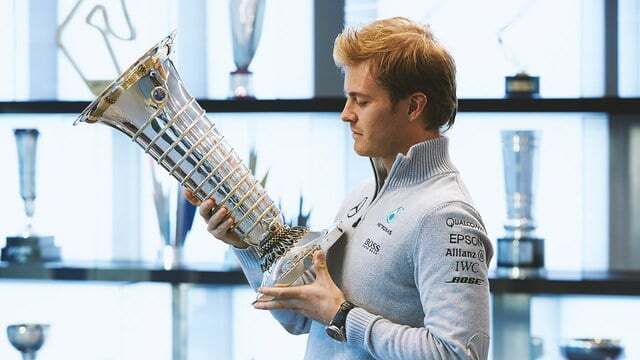 2016 saw all the luck fall in Rosberg's direction and was likely the only opportunity he would have to take a world championship. It was hard, hard work, a long slog and full to the brim of psychological battles, but Nico won through and got that coveted number one spot. Where else could he go from here? Repeat the season and know it's not likely to happen again? Go to a team who will likely have an inferior car? Once you're at the top, you can easily believe the only way is down. Rosberg does admit that it's an unexpected turn of events that has put Mercedes under some pressure though. The only thing that makes this decision in any way difficult for me is because I am putting my racing family into a tough situation. But Toto understood. He knew straight away that I was completely convinced and that reassured me. My proudest achievement in racing will always be to have won the world championship with this incredible team of people,the Silver Arrows. It does put Mercedes in an awkward position. They have an unexpected seat available at the fastest team on the grid. Who can fill the shoes of the outgoing world champion? Pascal Wehrlein is the obvious name that springs to mind, as he has been in the frame for a future Mercedes drive, has done plenty of testing for the team, and was clearly the line of succession for the team. However, the fact he was overlooked for the Force India role doesn't help his cause. The unfortunate thing about Rosberg's retirement is that we now have two questions that will remain unanswered forever. The first being whether he would run next year with the number one on his car, or stick with the driver branding of number six. The second, and more interesting thing, is that we will never know what the atmosphere at Mercedes between the two champions would be like. How would Hamilton deal with the fact that the playing field was level somewhat? If Wehrlein does make that step up, Hamilton is going to have far less pressure in the 2017 season than he would have otherwise. There are a lot of unknowns now that Rosberg has made this surprise decision, and if I'm honest, it's things like this that I love about Formula One. This is how it used to be - news breaking that turned everything you knew about upcoming events on their head. Well done to Rosberg, for winning his world championship, for doing the best job in difficult conditions, and for having the guts to go with his heart and stop when the time is right for him. And well done also, for making the 2016 off-season get off to a jaw-dropping start.